Use a single I/O pin of a TICkit processor or Parallax STAMP to interface to this module. Instantly open up 64 or 128 megabytes of non-volatile storage to your applications. Commands and data transfer takes place over a single signal wire using Protean's modified RS232 called "mono-wire". Data transfer takes place at 9600 baud, N81, inverted and is gated by the host processor to allow even slower interpreters to take advantage of the huge storage capability of Smart Media. Utilizes 3.3v Smart Media in sizes of 16Meg to 256meg. Fbasic Source code is supplied to allow the user to customize the interface or take advantage of additional on-board resources. Drives are formatted like streaming tape drives allowing multiple named streams. DOS format is NOT supported at this time. 128Kbyte Dram on board for buffering. 2 channel A/D and D/A hardware on board for a potential implementation of audio recording and playback. All timing issues are handled internally. Commands are send and forget type. 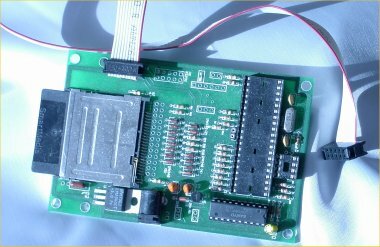 The SMD232A is an RS232 serially controlled drive for Smart Media type Flash disks. The SMB232A allows a host processor to read and write to Smart Media. A single disk can store up to 256Mbytes providing for huge data storage. This product is based on the TICkit 84 device and can be modified for more advanced functions.